Eastern Market “Come Hungry, Leave Happy” Strolling Brunch Tours – 2019! We’ve been doing Eastern Market tours for 15 years and it’s still a fan favorite! 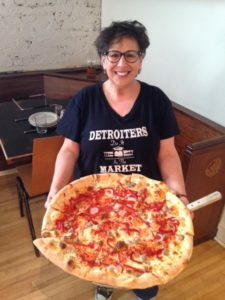 Delish Detroit will stroll from shed to shed and visit specialty stores to learn about unique products, hear fun facts and history of the area, while going behind the scenes and sampling various foods. Enjoy eating locally produced pizza, popcorn, pickles and pastries; specialty sausages and cheeses; authentic spinach pies and spreads, seasonal nibbles & treats, and more! We’ll get to know local growers and vendors, and taste their grown- and made-in-Michigan foods. We’ll be exploring the stunning art murals in the Market along our way, many of which were created during the last four Mural Festivals, and we will also visit an art gallery, jazz club and/or a letterpress shop. Dress for the weather; we will be inside several shops and in the market sheds on our tour, as well as walking outdoors. Tours run rain, snow or shine! 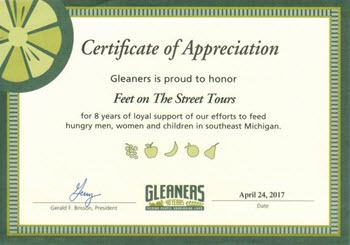 We are pleased to be donating $1 from the sale of each Eastern Market tour ticket to Gleaners Community Food Bank of Southeastern Michigan! Every dollar buys 3 meals for struggling families in our local community. And more 2019 dates to come!! *Approved for 2.5 CE clock hours for social workers (Provider number: MICEC-0067). Core Learning, Inc. is an approved provider with the Michigan Social Work Continuing Education Collaborative. For continuing education questions or grievances, please contact Core Learning, Inc. at 248-933-2673 or sappel@corelearninginc.com. For ADA accommodations, please contact Linda Yellin at 313-393-2055.